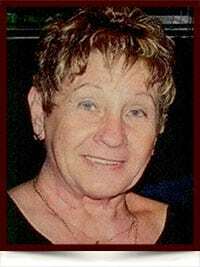 Viola Bourgoin ( nee Kirouac) - Edmonton's Burial & Cremation Professionals | Trinity Funeral Home Ltd.
Viola Bourgoin ( nee Kirouac) passed away September 18, 2016 at the University Hospital in Edmonton Alberta after suffering a severe stroke at the age of 76 years old. Born January 23, 1940 at Notre Dame de Lourde, New Brunswick to the late Doria ( nee Michaud ) & Emile Kirouac. The oldest of 15 children. Married Alveo Michaud on July 11, 1955 in NB and brought 10 children into the marriage. Alveo Michaud passed away from and accident March 31, 1971 leaving her with a large family. In February 1977, left NB for Alberta with her best friend, Edgar Bourgoin & later became his wife & born her 11th child. Together with Edgar’s adult sons worked all over Alberta doing construction. In 1988 they purchased a trap line #2360 and live on the line, trapping, hunting and fishing together. Retired in 2009 & resided in Caslan, AB. Viola was an amazing woman, stronger than most, a loving wife, a great mother, adored by her grandchildren, a loyal friend and loved life to the fullest. She was a great cook, had a passion for reading & gardening, possessed amazing bush skills, loved trapping, fishing & hunting. She was Edgar’s right hand in everything they accomplished in life. Predeceased in death by her mother and father, Doria (nee Michaud) and Emile Kirouac. First Husband Alveo Michaud, three Brother, Reginald Kirouac of St Albert, AB, Leandre Kirouac & Marcel Kirouac of Grand Falls, NB. Sister in Law, Rosemarie Kirouac, One son in law, Dominique Carron from Rivera-du-Loup, Quebec, and a grandaughter Cindy Laundry. Many Nieces & nephews, Cousin and friends. Cremation to follow with no services held as per her living will. When I am gone, release me. You have many things to see & do. You must not tie yourself to your tears. I gave you my love.. You gave me my happiness. by trust and your memories of my heart. I’ll greet you with my smile. Deepest sympathy to all her family from ours. Dad asked me to try to find Edgar and Viola as we stopped by your old place in Caslan in August and had left a note.,,,and I found this posting. So very sorry for your loss…lots of love and hugs to the family. Sincere sympathy for your loss to the whole family Viola touched a lot of people including us. Sympathy to the Kirouac, Michaud and Bourgoin families …. Indeed, she was a hardworking woman and we met her back when she and Alveo lived near the CN bridge in Drummond in 1965, Alveo being my brother-in-law Gabriel’s older brother . May Viola Rest in Peace …. condoleances to all her family. My sympathies Edgar, we will all miss your great hunting companion and a a great friend to all. Our deepest sympathy to you, Edgar, & family. Very sad, Vi will be deeply missed. Our thoughts are with you. Nos sympathies Pépère!! Ont pensent à vous!!! Xoxo prends soin de toi!! Sarah, Yvan et les filles. we send our condolences to the family, loosing a mother and grandmother is very hard for a family but she will always be with you in spirit , and always keep an eye on you .